1. Frankfurter Knackwurst – pork casing (Beef & pork) 4 to lb. 2. 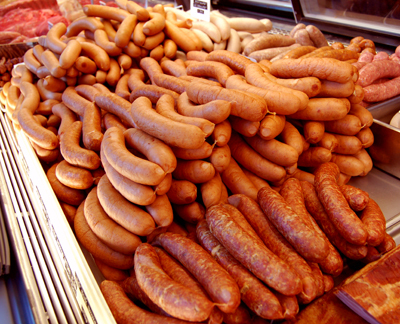 Knackwurst – beef casing, short & larger diameter(Beef & pork) 4 to lb. 3. Wieners / Seitenwurst (Beef & pork) 6 to lb. 4. Smoked Sausage / Metts / Smoked or Red Brats (Beef & pork) 4 to lb. 5. Smoked Cajun – spicy (Pork) 4 to lb. 7. Smoked Italian – medium with fennel (Pork)4 to lb. 8. Smoked Sizzlers / Nuernberger Sausages (Pork) 12 to lb. 9. Potato Sausage (usually in freezer)(Pork & potatoes) 4 to lb. 10. Smoked Beef Polish (Beef)4 to lb. 11. Bratwurst / Weisswurst (Beef, pork & veal) 4 to lb. 12. Bockwurst – with parsley & green onions, fine (Beef, pork & veal) 8 to lb. 13. Grillwurst – with parsley & green onions, coarse (Beef, pork & veal) 6 to lb. 16. Sizzlers & Brat Schnecken / Snails – mild breakfast links (Pork)9 to lb. & 2 to lb. 17. Cajun – spicy (Pork)4 to lb. 18. Kielbasa – medium (Pork)4 to lb. 19. Italian – medium with fennel(Pork)4 to lb. 21. Hamburger Patties, unseasoned & frozen(Beef)3 to lb. 22. 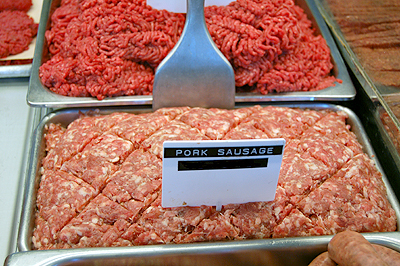 Frikadellen, German Clausburgers, seasoned & frozen (Beef & pork)2 to lb. 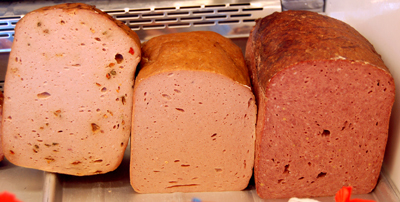 ***Fine Meat Loaves also available in small 2 ½ lb. aluminum forms to reheat in oven & serve.